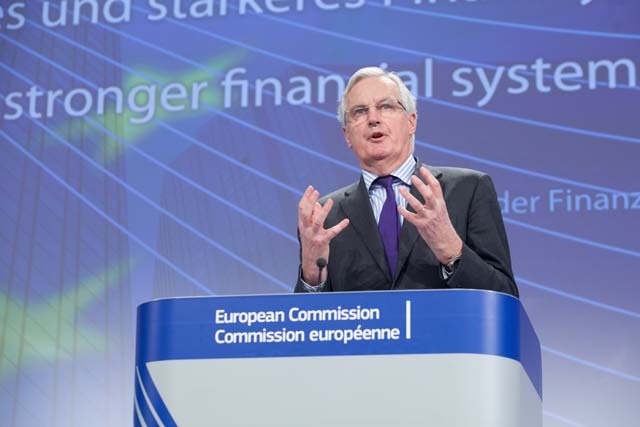 Michel Barnier, Member of the European Commission in charge of Internal Market and Services, gave a press conference on the proposals regarding the structural reform of the EU banking sector. (EC Audiovisual Services, 29.1.2014). Although the “Structural reform of the EU banking sector”, as proposed yesterday by European Commission member Michel Barnier, undoubtedly goes halfway to fulfilling the suggestions of the Erkki Liikanen High Level Group Report, it agitated people on both sides of the spectrum. Those who protect the banks by profession said it is ‘irresponsible’, and those who want to see the lenders cornered in the main street taking deposits and lending to the towns’ households and SMEs commented that ‘it changes nothing’. As a principle, the EU’s executive arm was supposed to use the Erkki Liikanen High Level Group report it had commissioned in 2011. The Liikanen committee recommended the outright breaking up of banks in two, one risk investment company and a retail banking services firm, with a clearly set target to ban the use of other peoples’ money for banks’ proprietary trading. The high risk part would be able to continue in this line but without using depositors’ money. In this way the high risk financial entities wouldn’t require taxpayers’ bailout. Today, the major European banking groups devote much less than one third of their balance sheets in loans to the real economy (companies and households). The rest is used to proprietary trading mainly in derivatives of any kind. Currently, Eurozone banks have accumulated assets of €42.9 trillion that is 3.5 times the GDP, while their American counterparts aggregated balance sheet is only 1.8 times the GDP. Eight Eurozone banks out of the 6,000 portray assets above the one trillion benchmark each, three French (Crédit Agricole, BNP Parisbas, Société Générale Group), two German (Deutsche Bank, Commerzbank), one Dutch (ING Group), one Italian (UniCredit Group) and one Spanish (Banco Santander). Between them they control assets of €13.5 trillion or one third of total. They are the ‘too big to fail’ but the problem is that they are also ‘too big to bailout’. The top forty of Eurozone banks have assets of anything around €27 trillion. Understandably these are the banks the Commission plans to incorporate in the new Regulation. In view of the gigantic proportions of this affair in every respect, financial, political even social, Bernier himself was reserved enough when presenting this Commission proposal. For one thing, the timetable for this initiative is very supple. The discussion in the Council is not supposed to begin before 2015. As for its full application, nobody can offer any credible prognosis. The Council will be the first legislative body where this discussion is to start and the mood there is already polemic. France and Germany will fight it all the way. In view of all that, Barnier indirectly accepted that the Commission doesn’t support a full application of the ground-breaking Liikanen Group report. That’s why the Press release issued after the presentation noted that “In drafting its proposals, the Commission has taken into account the useful report by the High Level Group chaired by the Governor of the Bank of Finland, Erkki Liikanen as well as existing national rules in some Member States, global thinking on the issue (Financial Stability Board principles) and developments in other jurisdictions”. In relation to this last observation about ‘developments in other jurisdictions’ it has to be noted that the Volcker Rule in the United States applies to all banks, while Commission targets only the 30-40 largest Eurozone banks. The passage goes like this: “The proposal on structural reform of EU banks will apply only to the largest and most complex EU banks”. In any case, it proposes to “Ban proprietary trading in financial instruments and commodities, i.e. trading on own account for the sole purpose of making profit for the bank. This activity entails many risks but no tangible benefits for the bank’s clients or the wider economy”. Unquestionably, this is not a small thing at all to propose. However, it doesn’t go all the way through. While the Liikanen report demands for a clear distinction between traditional banking and modern times financial betting, the Commission doesn’t follow this path uphill. In the second paragraph it asks the supervisors to make sure that the bank transfers the risky activities in another entity, but within the group (“subsidiarisation”). This will allow the bank to use other people’s money to back its own risky bets. It also leaves another door open by allowing “the Banks to have the possibility of not separating activities if they can show to the satisfaction of their supervisor that the risks generated are mitigated by other means”. Everybody knows that the banks can always hide whatever they want from supervisors, probably with some additional cost. It’s probably this additional cost that brought the champions of the banks to roof tops. The countries more strongly opposing this Commission initiative are understandably France and Germany, obviously because they have to protect the status quo. Already the two ministers of Finance Pierre Moscovici and Wolfgang Schauble have commented negatively. The Governor of the Bank of France and member of the European Central Bank Christian Noyer went as far as to accuse Barnier as “irresponcible”. This was expected from him because he is partly responsible for the fact that the three largest banks of his country can send France to the abyss. Crédit Agricole, BNP Parisbas and Société Générale have accumulated assets of €6.8 trillion, more than three times the country’s GPD. What about the rest of the French banking sector? So Noyer has every reason to be itchy. In conclusion, the problems of the banking sector seem to bother France more than any other Eurozone country. Germany may have to face similar financial questions with Deutsche Bank and Commerzbank, but it has a national cushion of at least one trillion and formidable foreign surpluses, while France is a deficit economy in every respect. That’s why France is much more vulnerable and itchy when it comes to lenders. In any case Europe, including Britain, will have great difficulties in confronting the problems of its banks, starting with their capital needs. Poor Greece, Ireland, Portugal and Spain paid the price for that, by being forced to recognise and repay their crazy debts to German and French imprudent lenders at face value. Little Iceland had it its own way and let the lenders, not the people, in the cold.